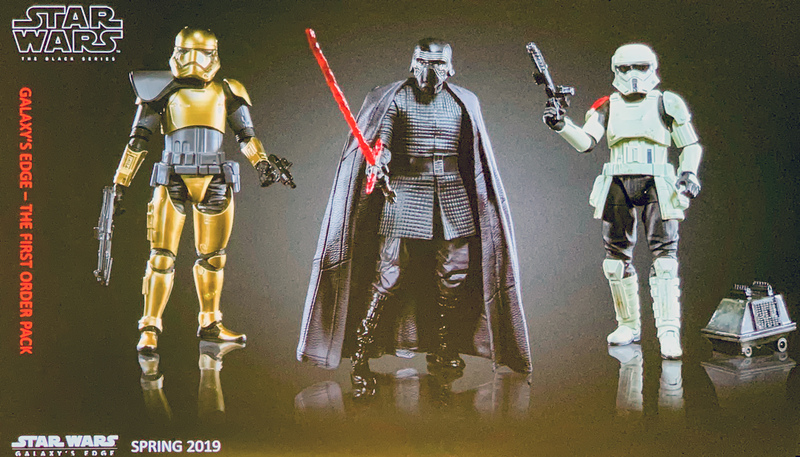 Three New Black Series Galaxy's Edge Exclusives Announced! And here some news that will certainly go over well… apparently the announcement even received loud boos at the presentation: there will be three exclusive Black Series sets for Disney’s Galaxy’s Edge theme park. Click through for the pictures! So, Hasbro got quite a few boos when they announced that Disney’s Galaxy Edge would receive three (!) all new exclusive Black Series sets. And while some of the figures are just repaints, repacks or retools, there are also brand new figures in the sets that collectors will now have a hard time getting. I suppose the scalpers on ebay popped the champagne earlier tonight. One can only hope that Hasbro will eventually make these available to the 99+% of the population that will never visit Galaxy’s Edge! Now, how and when are we supposed to get a hold of that mouse droid, Commander Pyre and the Mountain Trooper? We get a weathered R2 and BB-8, plus a retooled C-3PO who now inherits the articulated elbows from 4-LOM. 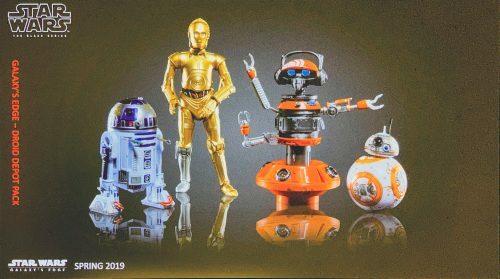 The all new droid is RX-24 aka DJ Rex from Star Tours, he was also in an episode of Rebels and he wil be the DJ at the Galaxy’s Edge cantina. Good luck hunting him down! Would Hondo be happy not to be available to all fans? So, Hondo will finally come to the Black Series. But unless Hasbro will eventually offer the sets on their website and unless Hasbro makes these sets available to international collectors (most countries on Earth don’t have a Disney theme park) almost no one will ever get a chance of owning the figure. Unless you are happy to pay big bucks on ebay, that is. 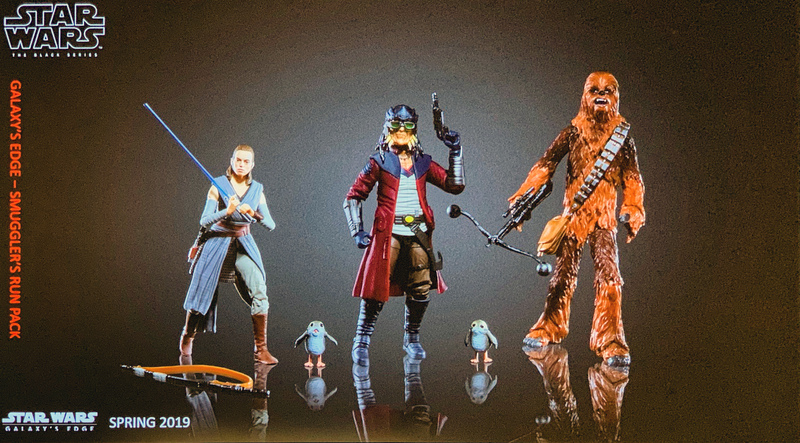 So anyway, those are the exclusive sets for Galaxy’s Edge. And while they mostly offer us retools and repaints, the few all new figures make it all the more sad that Hasbro made these exclusive to Disney parks. We will give you more info on potential availability elsewhere as soon as we learn anything! All New Black Series Disney Parks Exclusive 4-Pack! The Black Series Rocket Trooper Up For In-Store Pre-Order! Next Article: The New Episode IX Toy Box Art!